In Finchley there is no comprehensive free standing War Memorial. At the end of the Great War, the local cottage hospital changed its name to Finchley Memorial Hospital in honour of those who had given their lives, however, no names were listed. The listing of names is the most common form of Remembrance. We firmly believe that the naming of the dead emphasises their existence as individuals and shows the enormity of the losses. They gave all that they had, they gave life itself. To date, we have researched 554 names of Finchley war dead from the Second World War and 750 names from The Great War with more being added to the database. Four brothers from Finchley were killed in The Second World War. One was awarded the VC, yet nowhere are their names recorded on a local War memorial. It is time to put this right! This site is creating a searchable database for anyone to trace their family killed in service, across the areas in Barnet, North London, UK. 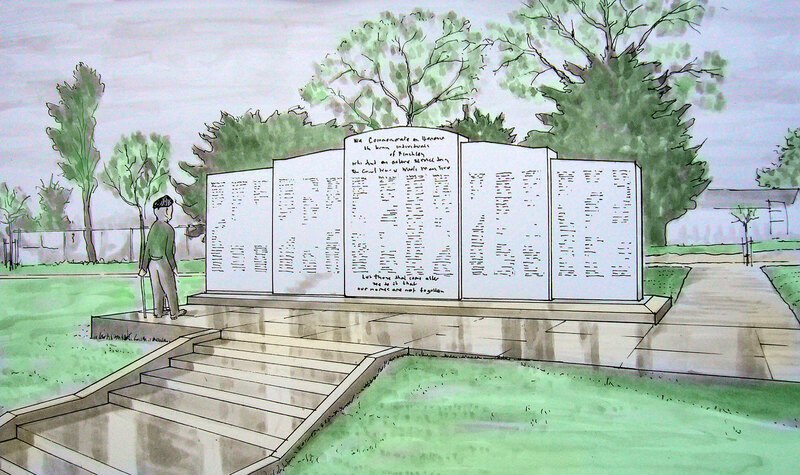 We are a UK Registered Charity (No 1178115) and hope to provide information and reference, while ultimately, raising the funds, through sponsorship and donations, to build a permanent War Memorial In Finchley itself (artists impression shown above), and for which the site has been selected, with the names ready and waiting! At nearly 100 years since the end of The Great World War and seventy years since the end of World War Two, these brave heroes have waited long enough to be Remembered and honoured and commemorated for posterity. We hope this ‘Digital Memorial’ is a fitting tribute in itself, but once complete, we also hope your generous donations and contributions to this worthy cause will enable us to achieve our ultimate goal of building and dedicating the Finchley War Memorial. We feel it’s essential that we remember the ultimate sacrifice these men and women gave for King and Country.